How do I go about purchasing a headstone ? What cemetery rules may apply ? What interaction is required with the cemetery ? Cemeteries are either owned by a County Council or they are Parish run. All normally have rules and regulations for granting permission to erect a headstone. Dependant on the cemetery, there can be a fee charged for this. The permission will normally be applied for on your behalf by the monumental mason and any fees will be added onto your account. Only when permission is granted can the work proceed on your grave. How soon after a burial can I erect a headstone ? Lawn cemeteries facilitate a headstone to be erected immediately – as soon as you wish. 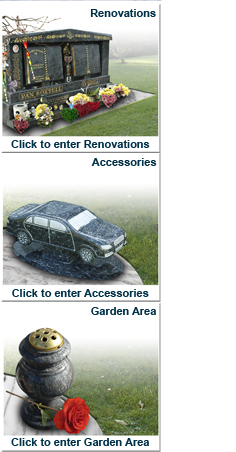 In Kerbed Cemeteries you can also erect your headstone and surround immediately. However, it is advisable that the centre of the grave is not cemented until the ground settles normally at least 3 months. Putting peat moss / clay on the grave will aid the settlement of the grave after burial. 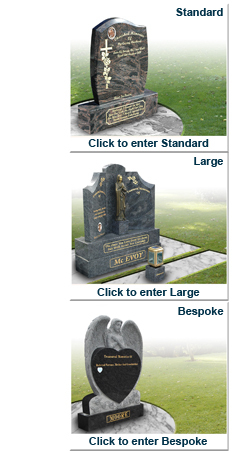 How long does it take to erect a headstone after ordering ? Once the relevant permission has been granted the order can proceed. Normally, dependant on availability of material, a headstone will be erected within 4 weeks. People also choose certain times of the year to erect headstones e.g. Blessings of the graves, Anniversaries, Birthdays, Religious holidays. Can I select scenes and inscriptions fonts for my headstone ? Yes. On order, when an inscription is given, a mock proof will be produced showing how the lettering will look on your chosen headstone. You can choose from a wide range of font styles and scenes to personalise your headstone. Advice would also be given on lettering colour that will suit best e.g. Black, White, Gold, Silver. What do I look for when buying a Headstone ? This is visible in memorials that have already been erected in your local cemetery. Always compare different monumental sculptors by their own craftsmanship and finish. Many monumental sculptors charge similar prices for monuments of a much poorer quality. Shop around and always ask questions about the monument you are buying making sure you are getting the best deal with no hidden extras. Reputable companies will price your headstone with all costs, not add extra for your inscription or kerbing after you have ordered. Any good monumental company employs fully qualified stonecutters. In recent times companies have begun buying in already cut memorials and simply lettering the headstone. The Majority of these companies will demand money up front to cover this cost and will only be able to do the basic work of a stone cutter. Only buy a headstone from a fully insured monumental company with a premises. Never buy a headstone from anyone in a cemetery or with only a mobile phone number. You want peace of mind if anything is wrong with your memorial or you require further inscriptions that is why you should buy a headstone from a monumental company who specialise in headstones (not from a gravedigger or a funeral director). Inscriptions on memorials should be laid out flawlessly and should be easily legible. This is a factor that is over looked by many unqualified monumental companies and others. Fonts and sizing is as important as the colour or shape of the stone itself. Any decent monumental company should provide you with several layouts of what your headstone should look like so you know what to expect. Always ask a monumental sculptor what kind of gold do they use on their headstones? Almost all good monumental companies use 23 1/2 Gold leaf and not gold paint. Gold leaf is pressed and gilded into the carving of the stone. It looks the best and lasts longer than any other. Gold paint which is very cheap fades and resembles a faint mustard yellow. Never give a deposit unless the Monumental Sculptor is a well established company. No monumental company should ask you to pay for your headstone in full upon ordering. Most monumental stone should be stocked and carved to your specification and ready to be erected before full payment is required. Buyer Tip- Always remember the cheapest price doesn't always mean the best deal.